First impressions mean a lot, even if they’re not always right. When I first opened the set of Porsche Knives we received from Chroma I was a little taken aback. The light reflecting off the shiny stainless steel reminded me of something out of a bad horror movie. You know the one I mean, the supposedly dead victim wakes up on an autopsy table only to realize they can’t speak as the doctor leans over, scalpel in hand …. Okay, you get the idea. After carefully (very carefully) washing, drying and arranging by size the nine (9) Chroma Type 301 Porsche knives my first impression is that the sleek, modern, stainless steel design reminds me of surgical implements rather than ordinary kitchen cutting utensils. Hmmm, maybe my first impression wasn’t too far off the mark after all? However, once in my hand any fear of these precision instruments quickly disappears as the control in the kitchen I now possess becomes sharply evident. 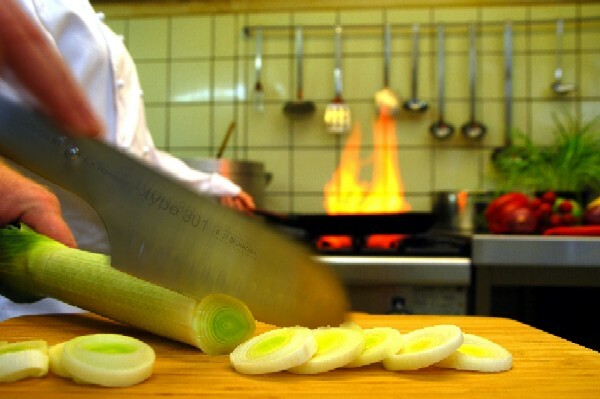 Whether you are a professional chef or enjoy cooking at home, good knives are essential tools in the kitchen. When purchasing a knife important considerations are handling, sharpness, durability and cost. For those of you familiar with other products designed by Porsche, it should come as no surprise that the ergonomically designed handle and sharpened Japanese steel (shouldn’t it be German?) of these Porsche knives have tomatoes, lemons, garlic and other foodstuffs cowering in fear as I look for things to slice. A quick flick of the wrist and some slight pressure on the Chroma 3-1/4-Inch Paring Knife makes speedy work of an unlucky lime. The 10 Inch Chef's knife cuts a butternut squash as easy as a Porsche beating a Pinto around the 'ring. Blade and handle blends together in seamless design. Thankfully, Porsche and Chroma provide stability management in the form of a thoughtfully placed “pearl” on the handle that guides your grip into the perfect position. With out any fear of a slip I make quick work of a small onion. The sharpness of these Porsche knives is extraordinary. As most cooks know, your risk of injury is conversely proportionate to the sharpness of your knife. In other words a dull knife is a dangerous knife. Cutting a tomato could be a risky proposition with my old Henkel blades. The only danger now comes from overeating as the ease of use of the tomato knife makes it possible to rapidly cut more than I can eat. These Porsche knives are manufactured with high quality steel that will last longer, stay sharper and be easier to hone then most other knives in your kitchen. 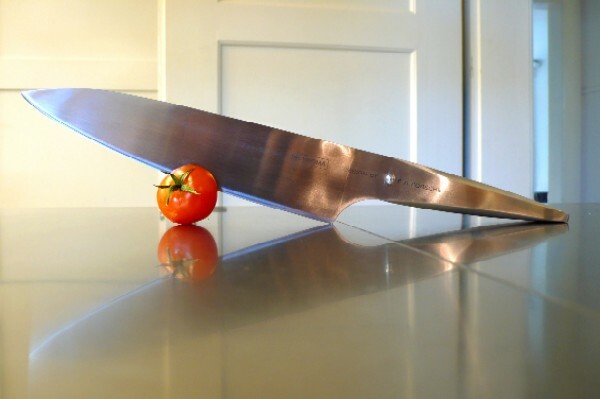 Costs range from $36.95 for the 3 ¼” paring knife to $118.95 for the 10” Chef knife. 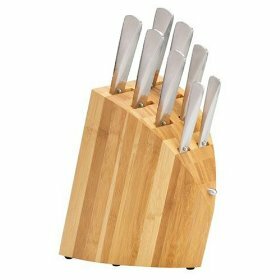 A Chroma 8-Piece Knife Block Set is available for $589.95. While not inexpensive, the Type 301 Knives are similarly priced to better known brand names of lesser design and quality. Just as Porsche automobiles are carefully manufactured and calibrated machines, the weight and balance of these kitchen tools are as perfect as can be. Unlike anything else I’ve ever seen, the Type 301 knives are designed to stand upright when not in use; a handy feature when working on a small cutting board or with multiple knives. If you don’t want to leave yours upright and exposed to the elements an optional garage is available in the form of a solid, heavy and aesthetically pleasing hardwood storage block. This modern set looks at home in any kitchen (including mine) but would look even better in one that happens to be designed by Poggenpohl. As with most nice things proper care is essential. Just as you wouldn’t expose your Porsche to the potential damage from a "drive through" car wash, never put these beauties in the dishwasher. Don’t defer maintenance either. Careful and consistent sharpening with a whetstone is the only scheduled service your blades should ever need. Simply wash by hand in warm water and these knives will last a lifetime. Special thanks to Michael at Chroma USA. Michael spent a lot of time explaining the relationship between Chroma and Porsche Design along with the distribution model for the Type 301 knives. If you're interested in purchasing any of the knives in this review you can do so directly on Amazon (through the links provided) or through any of the numerous Chroma resellers. Remember, Chroma guarantees any stainless steel product that it sells to be free from defect in material, construction or workmanship for the life of the product under normal use and following the care instructions. I’m inspired to buy a set. Now that’s a review! That was an excellent intro and your sense of humor is superb. I think Mr. 993C4S should add a regular feature to this blog that presents a woman’s point of view about the cars, products and the lifestyle. Or…are all Porsche enthusiasts male only? Some years ago we have bought a set of Chroma knifes Porsche design nrs P529 and P06. The store where we bought this was “The Bijenkorf” in The Hague, The Netherlands. We believed the knifes were rust proof. But now we notice some rust on ALL the knifes. The people at the Bijenkorf told us that the term of the guarantee was over and asked us if we have the receipt. But it’s over more than 2/3 years ago so we don’t have the receipt anymore. We’ve paid a lot of money for these knifes because we thought we’ve bought real quality. In mine opinion is when a product is sold as rustproof that this means forever and not for a specific periode. We have never cleaned them in a dishwasser. I got a set of these in the Fatherland a few years back…. The Best Knives I’ve ever used in my life! I Love Them! My knife has never even been near a dish washer, dropped it tonight and it broke? How is that possible. Landed on the tile floor, omg i am crushed and don’t understand how that could happen. One of ours broke. We reached out to the distributor here in the US and they replaced it free of charge (5-years after purchase).